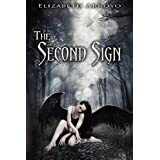 The Second Sign by Elizabeth Arroyo published Feb 2013 by Sapphire Star Publishing. $3.98 CDN Kindle edition. Bred to believe in the war between angels and demons, Gabby has come to the conclusion that love is responsible for war, jealousy, and all the other deadly sins she can think of. So when she’s exiled to the middle of nowhere for getting kicked out of her fifth school for fighting, she doesn’t expect to meet Jake. Much less fall in love. But Jake is quickly drawn to the eerie beauty of her violet eyes while Gabby is unsettled by their undeniable connection. When a demon guardian comes to collect her soul, she refuses to give it up. She’s not a demon. She can’t be. Her father and twin brother are angels. The demon gives Gabby twenty-four hours to decide her allegiance, and then starts killing her short list of friends, leaving a message behind: She is the Second Sign. I have to give this a WOW straight up. I have to say that I am pleasantly surprised that I liked this book as much as I did. I am not usually into Angels and Demons and that sort of story line, but this book sucked me in almost from the start and I couldn’t put it down. I was a little concerned with the first chapter being so dark and gory, but after that I really was drawn into the story and loved every minute. I think I might just read a few more Angels and Demon stories after all. The writing in this book is done exceptionally well and I found it easy to follow. There were a few instances where I had to reread a passage because of everything that was going on, but it didn’t hinder the story line. With all the twists and turns in the story it was explained well leaving nothing out. I was actually surprised with how much detail and thought went into the story as it was very complex. I love the idea of free will, even for Angels and Demons which one normally associates with good or evil. I also loved the suspense of the story as we don’t know what exactly Gabby is (although the cover suggests she is an angel of sorts) she is something different and unique. I really enjoyed this story but there is a dark element to it that may not be for everyone’s taste. Definitely 5 stars for me. This entry was posted in Uncategorized and tagged Elizabeth Arroyo, reviews, The Second Sign. Bookmark the permalink. Great review! The next book, The Second Shadow will be out in September! Can’t wait it was truly awesome! You’re welcome. Thanks for stopping by my website! Best of luck with the second book.